On April 3, 2019 the Matriach of our family was called home to be with the Lord surrounded by her loving family. 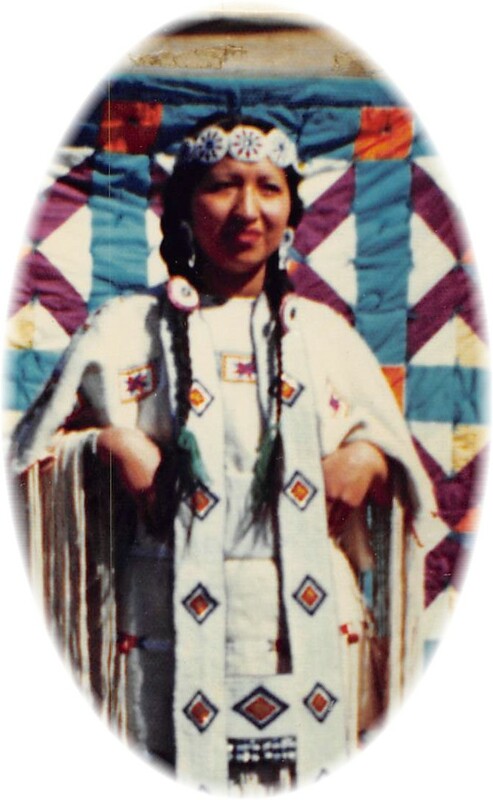 Our mother Anna who was a devoted servant to the Lord throughout her life was born on July 9, 1933 at the South Forks of Lame Deer to Alec Blackhorse and Mary Whistlingelk Blackhorse. During her younger years she loved spending time with her parents traveling by wagon to town to visit relatives or attend Powwows where she would dance and was one of the first War Bonnet society women. She also enjoyed berry picking & cutting deer meat. She attended St Labre where she graduated from high school in 1955. She met the love of her life Maurice (Moe) Limberhand Sr. & with that union came 10 children whom she loved dearly. Anna was well known for her beautiful Cheyenne beadwork and was also a great cook. She enjoyed singing Cheyenne Hymns, attending church and spending quality time with family. She always gave a helping hand and a place to stay for those in need. She loved to cruise the back roads or spend time at the land or cruise to get spring water. She was employed at the Factory at St. Labre, the Lame Deer Arts & Craft center & Northern Cheyenne Head Start in Lame Deer as a teachers aide and enjoyed teaching the children our Cheyenne language. The job that she loved the most was spending time with her children, grandchildren & great grandchildren. Annie’s home was always open to prayer meetings usually with the Golden girls, Leola, Vicki, Hazel, Helen, Freda, Martha , Carol Jessen & many other prayer warriors, always sharing their favorite dishes. This was passed down to her daughters who began holding prayer meetings with their mother at her home. Anna was very fond of her brother Senator Ben Nighthorse Campbell & wife Linda & always enjoyed when he came to visit & sharing gifts that they had for each other. Survivors include Children Darlene (David), Maureen (Loy) Bryant, Maxine (Leon), Maurice Jr., Donavon Sr., Enoch, Shawn, Joe (Virginia) Limberhand. Adopted daughters Rynalea Pena, Judy Tallbull, Emma King & Gloria American Horse. Her adopted sons Monte Larson, John McCormick & the late Rick Robinson & her nephews Francis (Hobbie) Blackhorse Jr., Avery & Duke Littlewhirlwind who called her Mom. Also survived by a special niece Elizabeth Hiwalker & her namesakes Laveta Killsnight, Mildred (Mustard) RedCherries & the late Anita Whiteman who held a special bond with her. Anna was very fond of her sister in law Erlyce Littlewhirlwind, her daughter in law Lori Morin Limberhand & her friend Teddy McMakin. Great Grandchildren Taleah YoungBear, Anfernee WhiteMan, Cale, Tanner Big Back, Malakai, Mason, Taylor Cade Lee, Noah Gregory, Aubrey, Harmony and Kymani Limberhand, Larell & Amilio Blackhorse, Prestley Shotgunn, Karaya, Wind Russell, Tuffy, Kaliyah, Kenyon, and Jaleel Bearing, Courtney Goudreaux & Salvatore also one Great great grandchild Hudson Limberhand. Those that were there to greet her were her Mom & Dad (Alec & Mary Whistling Elk Blackhorse), sister, Maxine; grandparents Rueben & Lena Blackhorse, her brothers Carl & Francis Sr., her children whom she missed dearly Esther, Sharon & Gregory (Quick Man), also Viola Sweet Medicine & niece Delphine Littlewhirlwind. Her sisters in Christ Leola, Hazel, Vicki, Carol Jessen, Martha & Freda. Anna was a woman of God & shared it with everyone she came in contact with. Special thanks to St. Vincent Healthcare, Lame Deer Public Health nurses, CHR providers, Stevensons & sons of Forsyth & adopted family Kassi Bigman, Vicki Cady & the late Rayetta Jordan & all those that provided care to her at home & during her hospital stay. The family thanks those that helped out with food, donations & prayers. Our family is very large so we apologize if we have forgotten anyone. Condolences to the family. Prayers for comfort. Losing a mother is a loss like no other. Annie is a wonderful woman. I will miss seeing n talking to her. Much love to you all. My prayers and condolences to the family. Its very hard to a Mom but with belief in Maheo, they are in a better place and are at peace with no more pain and suffering. Bless you all. I always enjoyed stopping in and visiting with her. She was always encouraging and always shared nothing but love. A strong woman of Christ for sure!!! What a loving and gracious woman was Anna! She always had a warm greeting and a friendly word! We enjoyed worshiping with her regularly each Sunday when we attend the Lame Deer Mennonite Church in the early ’80s. It was always so good to see her. She was a true matriarch and backbone of her family. Sending our love and condolences to the family……. TO THE FAMILY OF ANNA BLACKHORSE LIMBERHAND, THE NORTHERN CHIEF COUNCIL EXTEND THEIR MOST SINCERE CONDOLENCES AND PRAYERS FOR STRENGTH DURING THIS MOST SAD, SORROWFUL AND MOURNFUL TIME FOR THE LOSS OF A BELOVED LOVE ONE. I am very sorry to hear of Anna’s passing. I knew most of her children and some of her grandchildren. She always came to visit me during the parent teacher conferences held at Lame Deer Public School. She was a very devoted mother and parent. I had much respect for her. She was a proud Cheyenne. She will be missed by many. I am very sorry to hear of Anna’s passing. Anna always came to the Lame Deer Public School parent teacher meeting. She was a very devoted mother and parent. I always had a lot of respect for her. I do not think she ever missed a parent teacher meeting at Lame Deer School. I knew most of her children and grandchildren. She will be missed by many.